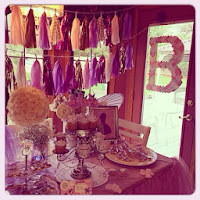 Okay - so y'all know how much I love to throw a party :) I love the planning, details, DIY projects, all of it. I'm on the hunt for people who love parties as much as I do and sharing some of their fantastic parties with y'all on a monthly basis! I'm not sure how Shelby found me, but I'm so glad she did. 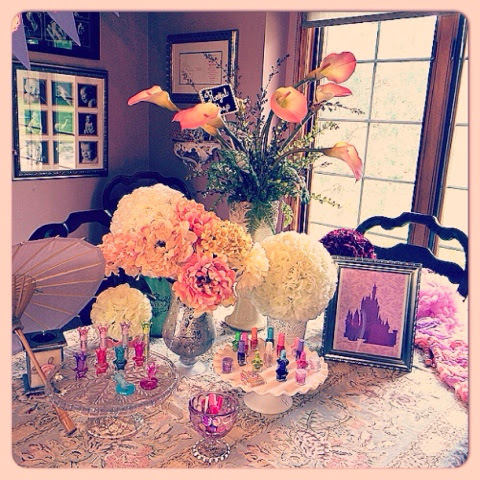 :) When she emailed me last year about doing an invitation for her daughters "Vintage Cinderella" themed birthday party I instantly fell in love with her love of detail and all things girly. Shelby has two (and another on the way!) of the cutest kids ever and her outlook on life and positive attitude is inspiring. She makes every day special for her kiddos and is absolutely precious! Hello friends!! 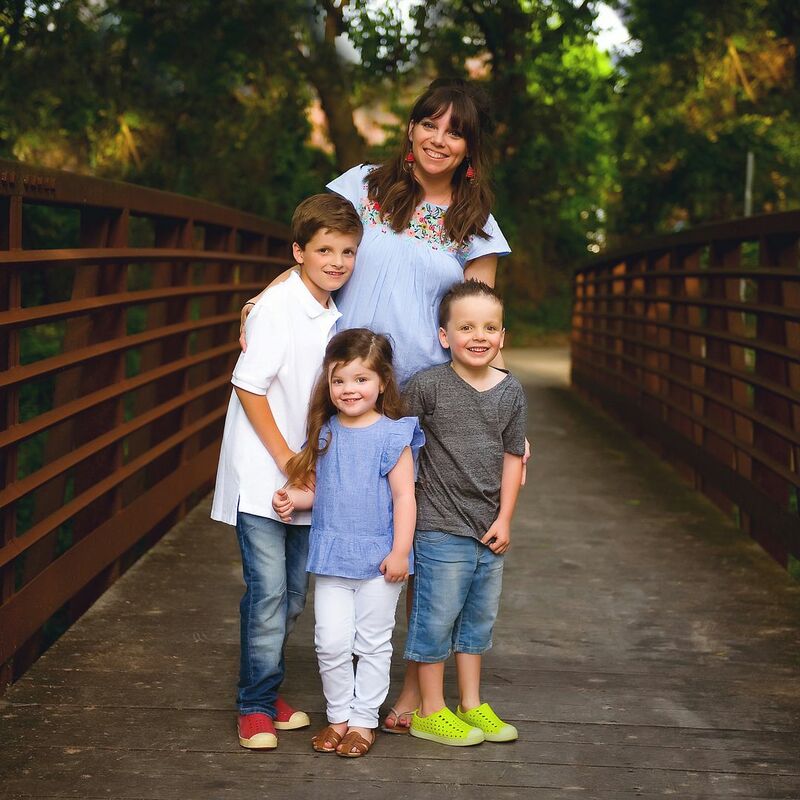 Thank you so very very much to the incredibly sweet and lovely Andrea for asking me to guest post about one of my very favorite things to do for my kiddies-- planning, creating, and making come to life a birthday celebration they will always remember! Andrea sure knows how to throw a majorly fun, gorgeous bash, so I was just beyond tickled and thrilled when she asked me to come on over and share my a recent birthday party I threw for my newly minted 3-year-old! Andrea designed an absolutely gorgeous blog design for me about a year ago, so I blog over at Mommyhood in Heels and Flats. Stop over and visit anytime; I would love to chat! I have a few neat posts in the works and blog about a wide array of topics from deep, soulful things to frilly, fun decor and party things :) God has brought me through a lot of challenges in life, and I am pretty much an open book about them and where He has brought me to today. From the moment I found out I was having a little girl-- after literally squealing, screaming, and hugging the ultrasound tech (she had something to do with it, right!? hahaha!) I could not stop dreaming of all the fun, girly things we would get to experience together. 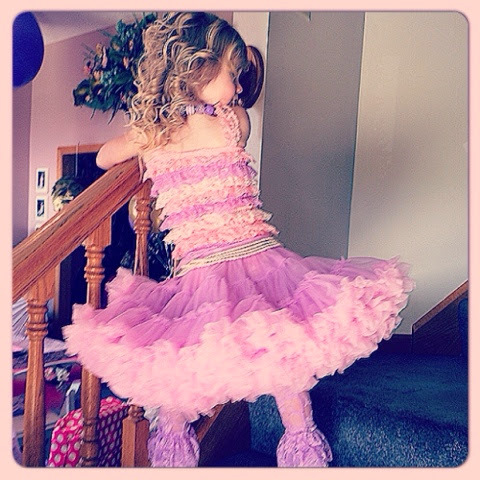 One of the most exciting parts of being a "girl mom" is planning birthdays for her to feel like a princess and create beautiful, fun memories to last a lifetime! 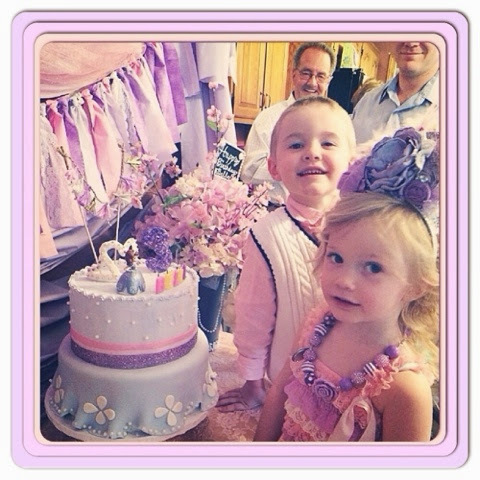 Each birthday for my kiddies (Preston, 5 and Bella, 3) I dream up a day full of fun, unique decor and plan for months their special day. It becomes my full-time hobby for a few months each winter/spring, and I would having it no other way! I enjoy every second! Anyway! 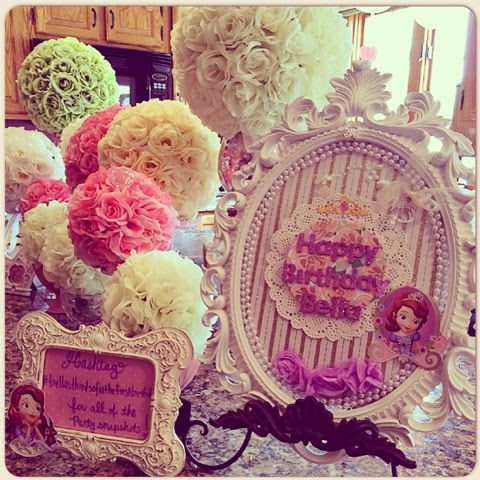 I hope you enjoy peeking in to my latest party for my daughter!! 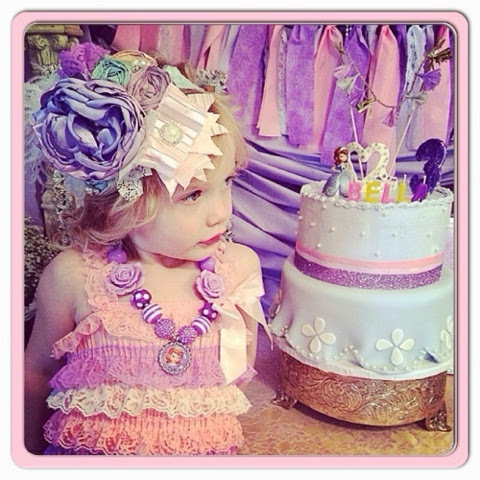 Here is Miss Bella in her party attire next to her cake. The necklace is from Josie James Boutique !! After Andrea blogged about their amazing necklaces, I just knew the birthday girl needed one for her big day! She fell in love with it SO fast! This year Bella has been obsessing over Sofia the First. I usually like to "sway" from the "characterey" themes but knowing how much she adored the sweet little show, I could not resist her strong desire! hahaha! I am self-admittedly ocd about the tiniest of details-- from handcrafted food signs to hand-written and crafted bunting (no cricut needed!) so even though I "promised" myself to not craft as much, it was impossible! I do buy some of the decor from Etsy, but a lot of it I do myself as well. Andrea did an amazing job creating and designing her gorgeous invitation! Slightly Askew Designs is my go-to for ALL of my party invites!! She is seriously so talented and the invites always turn out so amazing!! Every party needs a hashtag to commemorate all the details of that day, right!?!? 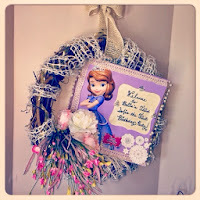 ...hence the framed hashtag reminder for party guests :) ~I also make a birthday framed sign at the entrance for all the kiddies' parties. It is the perfect keepsake to hold on to every year as well! 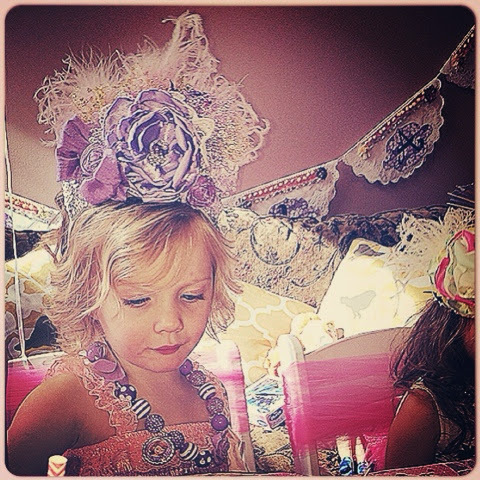 Some of the party guests with the birthday girl in their vintage lace crowns! 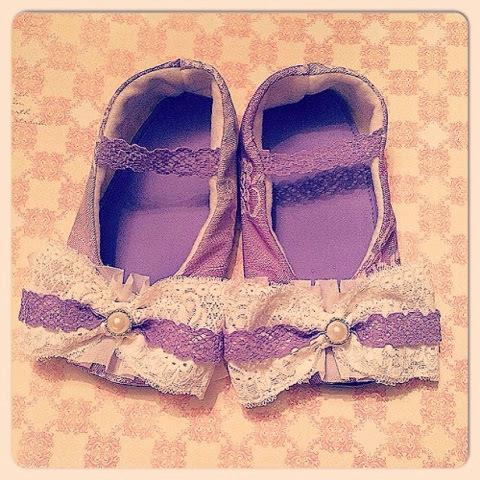 I recently became obsessed with Folly Parade shoes!! 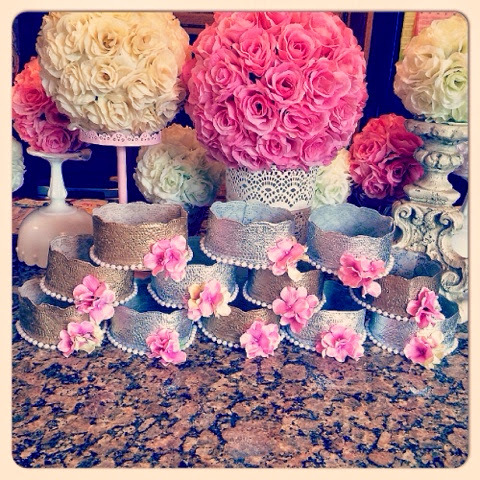 She does custom orders and has some fabulous choices for any special occasion you might be shopping for! Here we are putting her "lips" on as she says. She loves lipstick just as much as her mommy. The dessert table was flanked by a gorgeous tassel garland that I ordered from Homemadexojules --and adorable Etsy shop specializing in such decor. She did these custom colors for me, and I could not have been happier how it turned out! 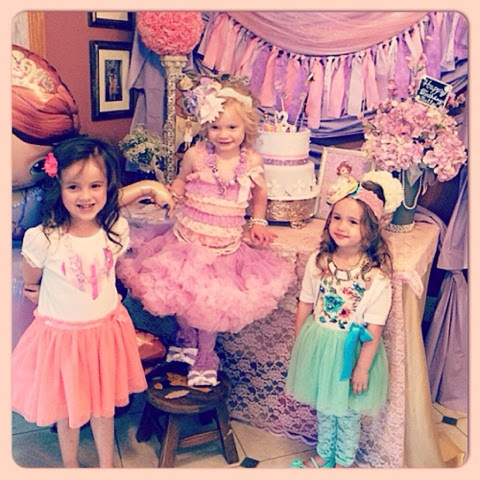 Bella and a few of her party guests by the cake table. Of course I needed a shot of this gorgeous pettiskirt! Pink is her favorite color, so I incorporated the lavender (which is just like Sofia) to create the perfect mix for her birthday outfit! I always love incorporating pictures from the last year somewhere at the cake table; this year I used a vintage cork board with cute flag pushpins from Target to display some of my favorites. 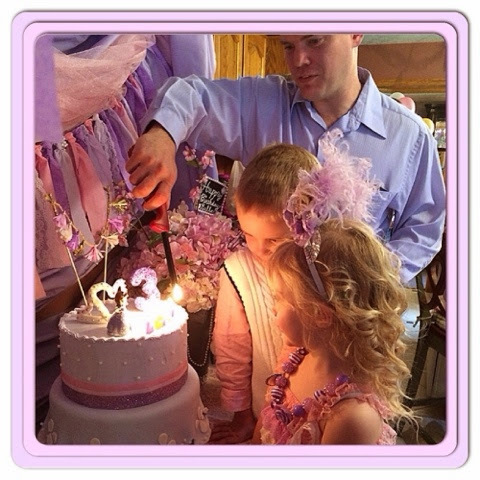 Big brother Preston has been front and center to help her blow out her birthday candles every year. This year was no different :) I love that she still lets him help! 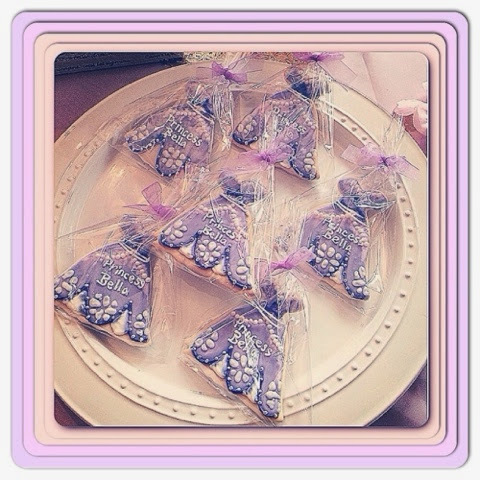 These cookies were absolutly perfect for the Sofia-themed party. I could not have dreamed up more appropriate ones for her special day. 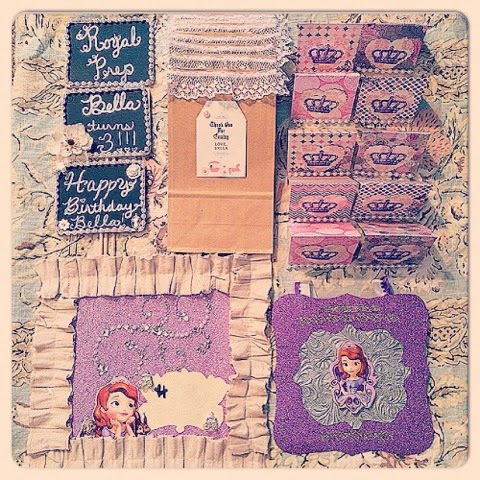 I made these party bags using a printable and adding a few embellishments to keep the vintage, girly look. Myself with the pretty birthday girl! Family shots are always so fun to get everyone smiling and looking at the same time hahaha! This was our best! ...and nothing so sweet as a precious Daddy/daugther moment during the party :) She adores him! 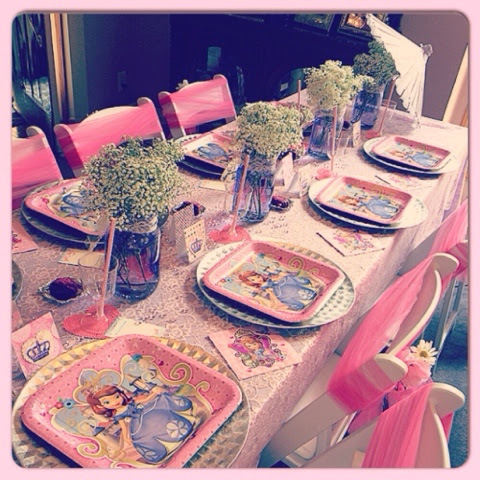 The table setting for the party guests was girly, fancy, and fun. I wanted to be sure I incorporated the "Sofia" character without making it over-powering. I think using just the plates and napkins with her image was just enough. 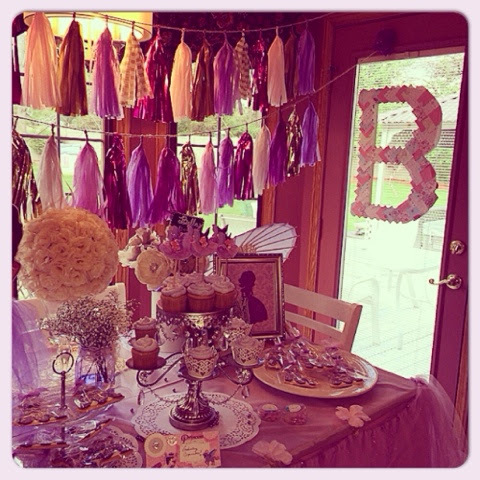 The lavender mason jars filled with baby's breath were my absolutely favorite. 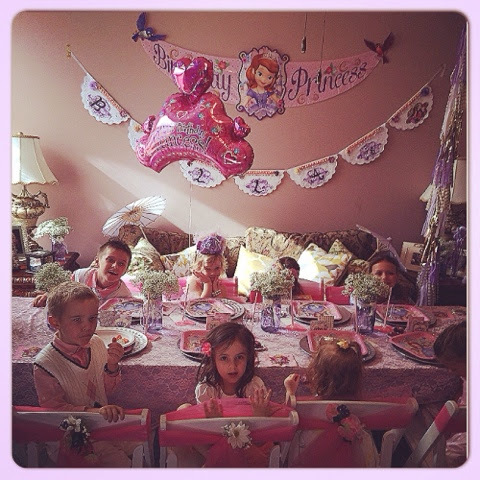 I rented the white chairs, and the chair covers were re-used from her 1st birthday party. 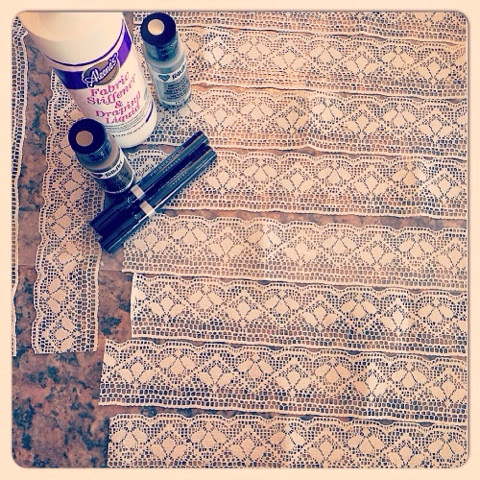 :) The tablecloth was lavender fabric with a light pink lace over-lay. I scored both of these on MAJOR clearance at Walmart the week of the party-- lucky!! I was thrilled! This was the "Royal Prep" area at the party was where the girls could choose a polish and paint their nails (or get them painted) The vintage lavender parasols were a fun added decor that were flanked different places around the party. They were a super fun touch and a perfect pictures accessory! 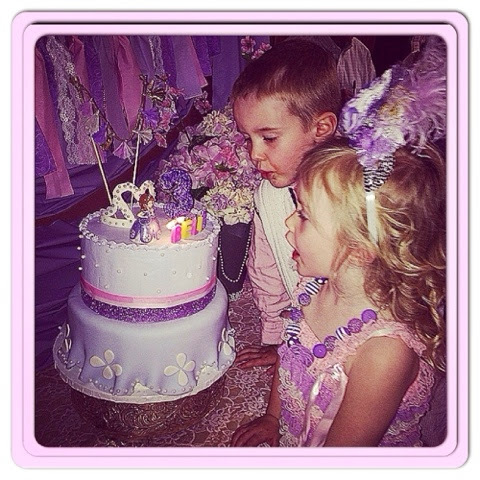 This last picture is of the birthday girl the night of her party! 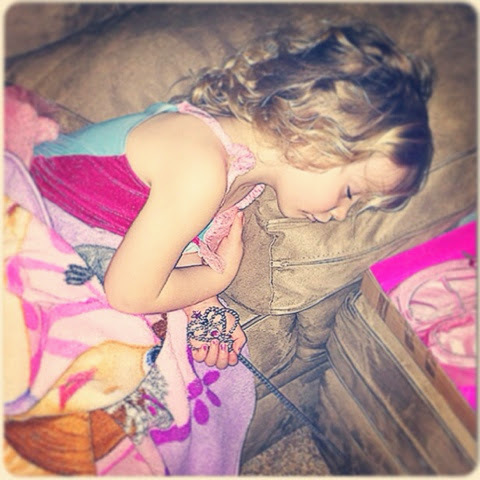 I came downstairs from turning down the beds, and she was literally holding her princess wand in her sleep!!! hahaha! I don't know what better picture I could have gotten to perfectly capture the end to her super fun-filled party with all of her favorite friends and family! 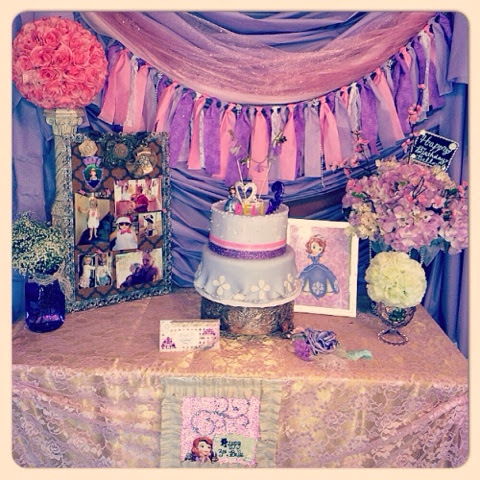 Thank you SO much for taking a fun look inside my latest party creation!! I hope you enjoyed it!! Don't forget to visit me anytime over at Mommyhoood in Heels and Flats &; much like sweet Andrea, I have to borrow her "overgrammer" term-- I do plenty of that daily on Instagram! 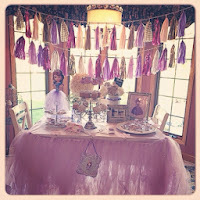 Follow along with our little family &; all our fun adventures at "blychic" !! Wow! That was a PARTY! 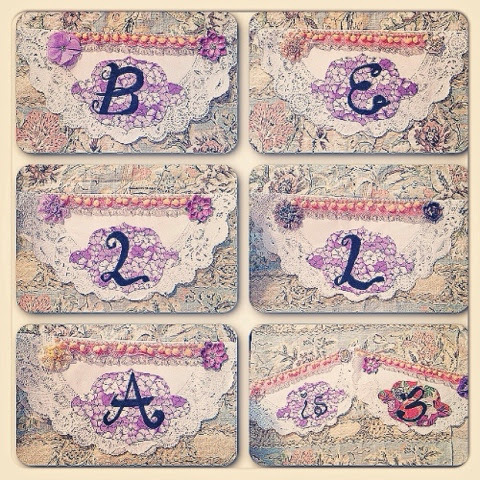 I love this new blog series!! I can't wait to see more!! I loved this! Bella is so adorable! What a sweet little family! 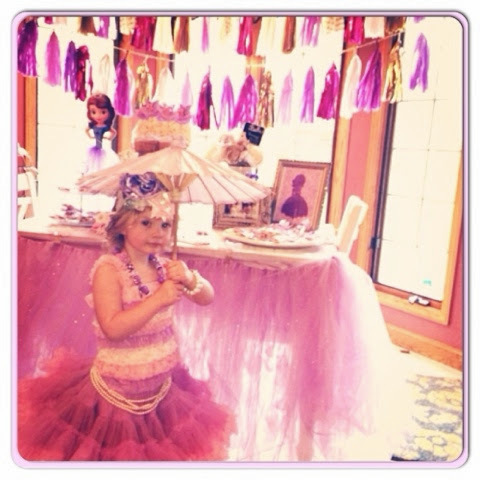 Such an over the top, fun, girly party!!! Looked WONDERFUL Shelby!! You never cease to amazing me with all of the perfect details! Love her! She is the sweetest!!! Looks awesome Shelby. Wish I could have been there to celebrate with everyone! Looks awesome Shelby! Wish I could have been there to celebrate with everyone!! I'm not usually a fan of character parties, but OH MY GOSH!! That was amazing! So pretty!!! Love this series! So exciting planning good party! Wow! What an incredible party!!! I love it! Loved reading this..,even though I got that lame mom feeling for both throwing a party like this..lol...this series is going to be so great to give us all great ideas. Thanks for sharing!!!! Happy Wednesday!!!! Amazing! I love how you put so much thought in to every detail. I bet the birthday girl LOVED it!